You have had surgery to replace your heart's aortic valve. Your doctor did the surgery through a cut, called an incision, in your chest. You will probably be able to do many of your usual activities after 4 to 6 weeks. But for at least 6 weeks, you will not be able to lift heavy objects or do activities that strain your chest or upper arm muscles. At first you may notice that you get tired easily and need to rest often. It may take 1 to 2 months to get your energy back. Even though you have a new aortic valve, it is still important to eat a heart-healthy diet, get regular exercise, not smoke, take your heart medicines, and reduce stress. Your doctor may recommend that you work with a nurse, a dietitian, and a physiotherapist to make these changes. This is sometimes called cardiac rehabilitation. For at least 6 weeks, avoid lifting anything that would make you strain. This may include a child, heavy grocery bags and milk containers, a heavy briefcase or backpack, or cat litter or dog food bags. Be safe with medicines. Take your medicines exactly as prescribed. Call your doctor or nurse call line if you think you are having a problem with your medicine. Your doctor may give you a blood thinner to prevent blood clots. If you take a blood thinner, be sure you get instructions about how to take your medicine safely. Blood thinners can cause serious bleeding problems. Wash the area daily with warm, soapy water and pat it dry. Don't use hydrogen peroxide or alcohol, which may delay healing. You may cover the area with a gauze bandage if it weeps or rubs against clothing. Change the bandage every day. Be sure to tell all your doctors and your dentist that you have an artificial aortic valve. This is important, because you may need to take antibiotics before certain procedures to prevent infection. New or increased shortness of breath. New or worse swelling in your legs, ankles, or feet. Feeling dizzy or light-headed or like you may faint. Feeling so tired or weak that you cannot do your usual activities. Not sleeping well. Shortness of breath wakes you at night. You need extra pillows to prop yourself up to breathe easier. Watch closely for changes in your health, and be sure to contact your doctor if you have any problems. 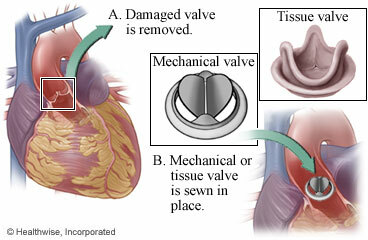 Enter D936 in the search box to learn more about "Aortic Valve Replacement Surgery: What to Expect at Home".